In this part, we'll consider the question; "Why does blobbing and stringing happen?" In Part 2, we'll consider, "Ok, so what do we do about it?" Let's look at these and, most importantly, how they interact with each other. Numbers in "( )" refer to the items in the list above. During a print, pressure is generated by the extruder as it forces solid (cold) filament into the hot end's heat block, where the filament melts. This molten filament is viscoelastic (1). That is, it acts both like a spring and can compress as well as like a viscous fluid (1) that can flow. Keep in mind that some filaments, like TPU and PETG, are themselves elastic (1) and can also compress like a spring And, just to be inclusive, Bowden tubes (short and long) create spring-like compression of the filament running through them. To say this succinctly; like a spring, the filament and molten filament is compressed by the extruder pressure because it is elastic. The pressure exerted on the molten filament is the force that pushes it out through the nozzle to form a layer of your print. When the extruder stops extruding, this pressure does not immediately drop to zero. There is some residual pressure in the hot end and that is what we call back pressure (2). If this back pressure is great enough (and it often is, otherwise I would not need to write this post), the compressed molten filament will look for an escape - and it finds one out the nozzle opening (3). And, for some very low viscosity molten filaments, they can actually pour out of the nozzle due to gravity (4). 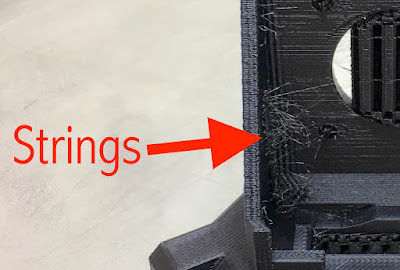 If it were possible to close off the nozzle opening (quickly) and reduce the back pressure (ideally) inside the hot end, there would be no oozing or stringing when the nozzle moves from one part of the print to another. But, that technology is not available in the RepRap world quite yet (but smart people are working on it). So, what are we, dear reader, to do? We recite incantations to the 3D printing deities, we jump through hoops, we create urban myths, we develop magic elixirs, and we often just cross our fingers and hope for the best. Or... we carefully consider the issues described above and thoughtfully learn how to mitigate the problems using the tools available to us - the primary tool is, of course, the slicer. However, there are others. Let me touch on a scant few of these others first, just to get your mental juices flowing before I dive into slicer strategies in Part 2. Calibrate your extruder - if your extruder is over extruding you are generating more pressure than is required and that ultimately increases the back pressure in the system. So, let me repeat, c a l i b r a t e y o u r e x t r u d e r. See my Extruder E-Step Calibration video for a simple tool and technique to do it. Make sure your extruder is functioning properly and the drive gear is clean of filament shard and engaging properly with the filament. 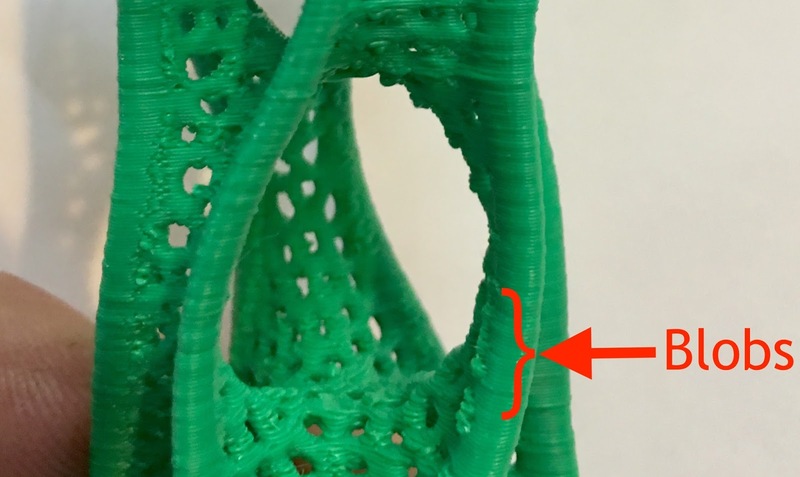 Also make sure the tension is set properly - too low and the filament slips, too high and you compress (diametrically) the filament and create other problems. If you are using a system with a Bowden tube (delta printer for example) make sure the tube is as short as possible. Also, and ONLY if you have an extruder that does not damage the filament surface like a Bondtech QR or BGM, use 1.8 mm ID PTFE tubing. The new Capricorn XS tubing (the black stuff) that is lower friction with a 1.9mm ID looks promising too and I'm testing it now. Overlong Bowdens, lots of slop inside the tube, and friction all increase the spring force - which as we now know, can lead to excess back pressure. Calibrate your hot end temperature - I didn't mention this above, but most molten filaments become more fluid with increasing temperature. So, if you think you are extruding at 195°C but your hot end is actually heating to 220°C, the melt will be more fluid, leading to blobbing and stringing issues. Minimize the distance between the extruder and the nozzle tip. Sometimes you have no control over this but if you do, then minimize it. One of the reasons the E3D-Online's Titan Aero extruder/hot end is so good (i.e. produces parts with minimal blobs or strings with very little work) is due to the very short distance from the extruder's drive gear to the nozzle tip. and as always, please follow my blog and subscribe to my YouTube channel so you don't miss it! 1 comment to ''Musings on Blobbing and Stringing - Part 1"
Cool. I really like your method to calibrate extruder e-steps and will use it on my machines. Thanks for this, very useful!